This short PostandFly.com.mx video, by Enrique de la Cruz and Tarsicio Sañudo, shows the spectacular inland scenery of the state of Chiapas in southern Mexico. The highlights are views of the Sumidero Canyon (near Tuztla Gutierrez, the state capital) and then some magnificent shots of the Lagunas Montebello, near the border with Guatemala, and the river scenery of Agua Azul. This video is apparently the start of a collaborative effort between PostandFly and photographic director Enrique de la Cruz to generate additional audiovisual resources utilizing new technologies such as drones. We will be keeping our eyes open in the New Year for more. Want to learn more about Chiapas? A good starting point is our very own Chiapas Map and Index Page, which has links to articles about the geography of the indigenous Lacandon Indians, poverty and inequality, musical instruments, tourism, agriculture, tectonic hazards, and lots more. Sadly, my one and only trip so far to the Lagunas Montebello was cut short by a vehicle malfunction. At least I was still able to make my way out of the park and back to civilization before nightfall! Presumably cell phones now work in the park, so such adventures are probably a thing of the past. May you have lots of your own adventures in Mexico in 2016, and always return safely! 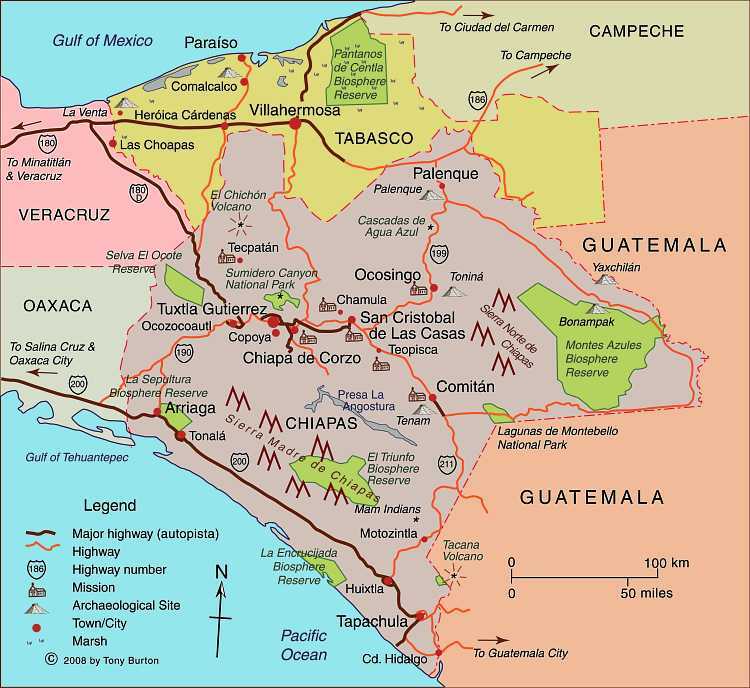 This Chiapas map and index page lists the most interesting posts on Geo-Mexico related to the southern state of Chiapas, and also links to a selection of articles about agriculture and poverty that place Chiapas in the national context. Map of Chiapas. Click here for interactive map of Chiapas on Mexconnect.com. Chiapas has huge tourism potential, apart from the Mayan site of Palenque, the state capital Tuxtla Gutiérrez, and the beautiful colonial city of San Cristóbal de las Casas (the former capital). The Lacondon Maya are one of the most isolated and culturally conservative of Mexico’s numerous indigenous peoples. Their homeland is in the remote Lacondon Jungle in eastern Chiapas, close to the Guatemalan border. The Lacondon were the only Mayan people not conquered or converted by the Spanish during the colonial era. Until the mid-20th century they had little contact with the outside world, while maintaining a sustainable agricultural system and practising ancient Mayan customs and religion. This short two-part video by Joel Kimmel (Part One above; Part Two below) briefly traces the history of the Lacandon back to the classic Mayan civilization. The videos document their successful, slash and burn, rotating, multicrop, subsistence agricultural lifestyle, steeped in religious ritual, and sustained over centuries in small isolated groups in the almost impenetrable Lacandon jungle. The film then looks at the more recent outside influences that resulted in the near extinction of the Lacandon by the mid 20th century. Today their population has increased again and is estimated at between 650 and 1000, living in about a dozen villages. The second video focuses on the Lacondon’s confrontation with the modern world over the past four decades. One group, the “southern” Lacandon have opted for Christianity and the trappings of modern life, whilst some in the “northern” group, centered around the village of Naja, near the Mayan ruins of Palenque, attempt to maintain the old customs and religion. The video ends with the thoughts of a former Director of Development at Na Bolom, regarding the possibility, and immense difficulty, of trying to preserve what remains of their language, cultural heritage and ecological knowledge, treasures the world can ill afford to lose. The videos introduce speakers and photos from the internationally famous Casa Na Bolom, in San Cristóbal de la Casas, Chiapas. This scientific and cultural research institute was founded in 1951 by Danish archeologist Franz Blom and his Swiss wife, Trudy Blom, journalist, photographer and later environmental activist. They devoted their lives to documenting the cultural history of the Lacondon people and life in the Chiapas jungle and advocating for the survival of both. Following Trudy Blom’s death in 1993, the Asociación Cultural Na Bolom has continued to operate the center as a museum, research and advocacy center, and tourist hotel. It houses an archive of over 50,000 photographs, and other documentation created by scholars over the decades. The two videos provide visual proof of the forces of modern Mexico that have threatened the existence of the Lacondon way of life – government roads opening up the jungle to loggers and other settlers, logging permits resulting in massive clearcutting of the mahogany forests , the arrival of tourism, Coca-Cola and canned foods, mainstream education and modern technology like satellite television. Not covered in the video is the fact that a Mexican presidential order in 1971 granted 614,000 acres to the Lacandon Community, recognizing their land rights over the, by then, more numerous settlers who had been allowed to colonize the Lacandon Forest under previous governments. This, however, has brought the Lacandon into conflict with many settler-groups, creating problems which continue to the present time. (See Chiapas Conflict on Wikipedia). Chiapas: carbon capture program or indigenous people? Will the southern state of Chiapas become a haven for ecotourism based on mangrove swamps? According to press reports such as Buscan dar “nueva cara” a Puerto Arista (in El Economista), there are plans afoot to develop nearby mangrove swamps as part of an ecotourism project. Local architects in the coastal town of Puerto Arista in Chiapas are backing the project to build what might best be called Mangrove Riviera. The initial investment required to get Riviera Manglar “Pakal Ahau” under way is around $120 million. The major advantage, from the state’s point of view, is that it would open up a new region of the state for tourism, cashing in on the area’s natural wealth, especially its mangroves. Proponents argue that the town could easily become a major center for ecotourism and that provided that the project incorporates a high degree of sustainability, and prioritizes the cultural identity of each location, it could be a model for similar projects elsewhere. The project would extend to a subregion including Bahía Paredón, Boca del Cielo, Playa del Sol, Bahía Marías, El Madresal, Mojarras, Laguna La Joya, Cabeza de Toro, Cerro Bernal, Manglares and Villa Tortuguero. In time, Puerto Arista could become another “tourist gem” in Chiapas and offer an interesting continuation of the long-standing Ruta Maya. Where are Mexico’s mangrove swamps? How fast are mangroves disappearing in Mexico? Following her trips, Richardson compiled a page summarizing agricultural statistics for Chiapas, Jalisco and Cuquio, based on Mexico’s 2007 Agricultural Census. The page has numerous tables and graphs about everything from crops grown and machinery used to irrigation, access to insurance, living conditions and other sources of household income. Richardson’s passion for produce that is organic and locally produced is admirable. The anecdotes in her diary entries are well told, and raise important issues about the overuse/abuse of pesticides and fertilizers,the exploitation of farmers, microlending and a host of other factors that caught her attention. While her diaries are certainly not a comprehensive analysis of agriculture in the areas she visited, they do shed some light on some of the important issues facing farmers there. The diary entries are worth reading for the many examples and photographs included. That said, Richardson’s online diary is a very useful resource and likely to be a valuable starting point for many classroom discussions. How sustainable is organic agriculture on the Baja California Peninsula in Mexico? Geo-Mexico has many other agriculture-related posts (easily found via our tag system). They include posts about the geography of growing/producing cacao, honey, sugarcane, coffee, Christmas trees, chiles, floriculture, tomatoes, tequila, horticultural crops and oranges. The proposed implementation of a United Nations-supported carbon storage program (REDD) in the southern Mexican state of Chiapas is provoking plenty of controversy. The debate is hotting up because a follow-up program called REDD+ is due to start in 2012. A good summary of the situation is provided by REDD rag to indigenous forest dwellers. It is a carbon storage program, started in 2008 by the Food and Agriculture Organization (FAO), the U.N. Development Programme (UNDP) and the U.N. Environment Programme (UNEP). At first glance, it would seem like a good fit for Chiapas, one of Mexico’s poorest states, where a high proportion of the population are reliant on subsistence farming. The Chiapas state government backs REDD, considering it as one way of helping mitigate the likely consequences of climate change in the state. Chiapas’ total emissions of carbon dioxide amount to 32 million metric tons/year, about 4.5% of the national figure. The Chiapas contribution comes mainly from deforestation and farming. 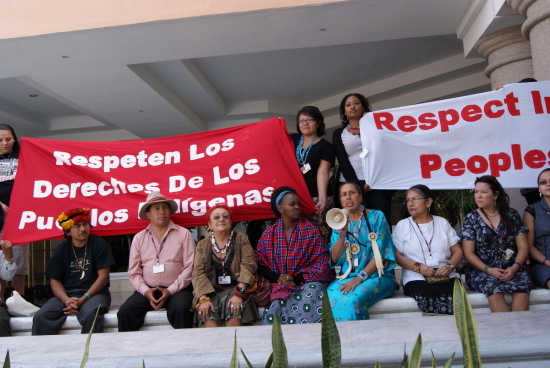 NGOs working in Chiapas warn that REDD poses a serious threat to indigenous people. 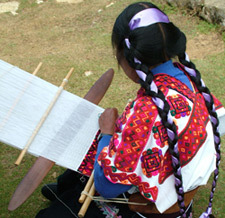 About 20% of the 4.8 million people living in Chiapas belong to one or other of the state’s numerous indigenous groups. Land tenure in many parts of Chiapas is hotly disputed; this was one of the reasons for the EZLN (Zapatista Army of National Liberation) uprising in 1994. As with so many geographic issues, there is no easy “right answer” here. The rights of indigenous groups need to be respected and their views taken into account, before any decision is made about the value of their forest home to global efforts to mitigate climate change. This is one controversy we plan to follow as it plays out in coming months. 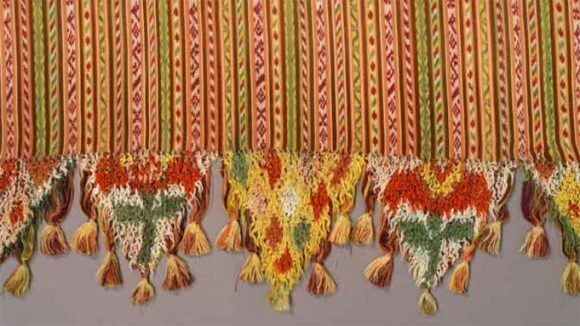 Kudos to the the New Mexico-based Grassroots Press, for the enticing title “Weaving Webs of Resistance in Chiapas” on an article by Crystal Massey and Rebecca Wiggins. The article reports on a visit to Chiapas earlier this year by a small group from the Las Cruces-Chiapas Connection (since renamed Weaving for Justice), which helps weaving cooperatives in Chiapas market their products through fair trade. One of the groups they visited was Tsobol Antzetik (Women United). They describe how these villagers have to carry fresh water (for cooking, washing, drinking) across the village from near the local school. Despite being in one of the wettest regions of the country, they have no easily accessible potable water source. Some of the women of Tsobol Antzetik belong to Abejas, a Catholic social justice organization founded in 1992, while others are active supporters of the Zapatistas (EZLN). None of the women accepts handouts from the “corrupt” federal government. This means that they refuse any of the possible benefits from Oportunidades, Mexico’s flagship poverty-fighting program, which helps about 60% of all families in Chiapas. The women believe that Oportunidades “hand outs” are a way for the federal government to control the rural population, and prefer to avoid being politically compromised. 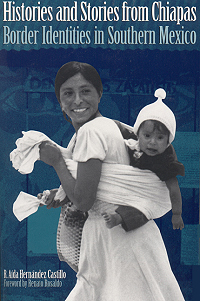 The article quotes sociologist Molly Talcott, who describes Oportunidades as “…essentially sterilizing women and attempting to contain women’s resistances [sic] by enlisting them in a small cash assistance program, which in these times, is badly needed.” Critics of Oportunidades claim that its health care workers are asked to meet sterilization quotas. 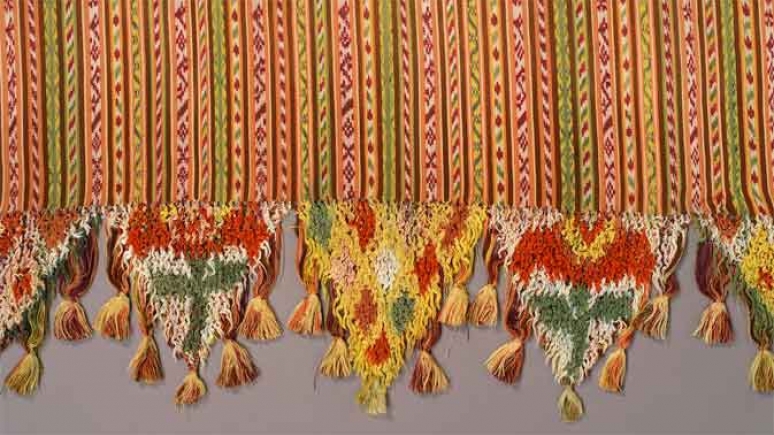 The marketing of woven items from Chiapas is an alternative way for women such as those in Tsobol Antzetik and their families to boost household incomes. This is where the Las Cruces-Chiapas Connection comes in. They help market the items in the USA and hope their help will offer an alternative to migration in search of employment to rapidly-growing cities such as Cancún or even into the USA. The article goes on to examine another much publicized development project aimed at improving the situation in Chiapas, the Mesoamerica Project (formerly known as Plan Puebla Panamá). A side effect of this project has been to force some indigenous people off their traditional land to clear the way for major high-budget, capitalist construction projects. One of the many strategies bandied about as part of the Mesoamerica Project is the forced relocation of rural Chiapas Indians into what the government calls “sustainable rural cities”, a phrase which suggests a less-than-clear grasp of geography! These would enable easier provision of modern services such as education and health care. In turn, they would “free up” potentially productive land that could then be used for agro-industrial plantations (flowers, tropical fruits, specialist timber, coffee). The major downside of such a proposal would be the demise of an ancient subsistence lifestyle, and an end to the food security previously enjoyed by thousands of Maya families. Opposition to the Mesoamerica Project has already led to unrest and violent reprisals. It is still far from clear what the eventual outcome of the Mesoamerica Project will be. 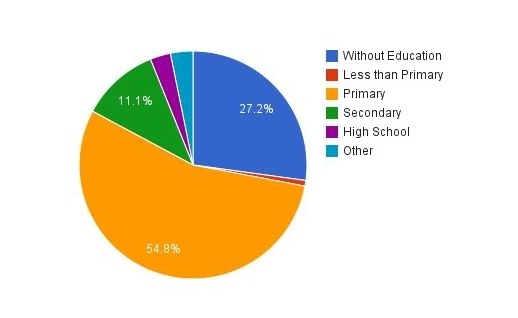 Related news: Up to now, Oportunidades has focused almost entirely on rural areas. However, the Interamerican Development Bank recently approved a loan of 800 million dollars to extend the program to marginalized families in urban areas. Mexico’s indigenous groups, social geography and development issues are analyzed in various chapters of Geo-Mexico: the geography and dynamics of modern Mexico. Buy your copy today, and learn more about Mexico’s fascinating geography. Additional knowledge will greatly enhance the pleasures you derive during your next trip to Mexico. The Mexican Mam (there are also Guatemalan Mam) first settled in Chiapas in the late nineteenth century, mainly in the deforested mountains of the eastern part of the state. They had virtually disappeared from view as a cultural group by 1970, having lost most of their traditional customs. Today, the 8,000 or so Mam, living close to the Guatemala border, have shown that it is possible for some indigenous groups to re-invent themselves, to secure a stronger foothold in the modern world. Mexican policies from 1935-1950 towards Indian groups were focused on achieving acculturation, so that the groups would gradually assume a mestizo identity. It was widely held at the time that otherwise such isolated groups would inevitably be condemned to perpetual extreme poverty. To the Mam, this period is known as the “burning of the clothes”. Almost all of them lost their language, traditional dress, and methods of subsistence, and even their religion, in the process. Indeed, for a time, the term Mam never appeared in any government documents. From 1950-1970, the Mexican government opted for a modernization approach, building roads (including the Pan-American highway) and attempting to upgrade agricultural techniques. The mainstay of the regional economy is coffee. During this period, most Mam were peasant farmers, subsisting on corn and potatoes, gaining a meager income by working, at least seasonally, on coffee plantations. Working conditions were deplorable, likened in one report to “concentration camps”. Plantation owners forced many into indebtedness. The Mam refer to this period as the time of the “purple disease”: onchocercosis, spread by the so-called coffee mosquito. Untreated, it leads to depigmentation, turning the skin purple, skin lesions and blindness. Reaching epidemic proportions, it devastated the Mam peasants who had no access to adequate medical services. After 1970, the Mam gradually re-found themselves, as official policy was to foment a multicultural nation. Some, especially many who had become Jehovah’s Witnesses, migrated northwards forming several small colonies, promoted by the government, in the Lacandon tropical rainforest on the border with Guatemala. Others, spurred on by Catholic clergy influenced by liberation theology, began agro-ecological initiatives. For instance, one 1900-member cooperative, ISMAM (Indigenous People of the Motozintla Sierra Madre), specialized in the production of organic coffee. ISMAM’s agro-ecological initiatives benefited from the advice of the community’s elders and rescued many former sound agricultural practices, such as planting corn and beans alongside the coffee bushes to avoid the degradation that can result from monoculture. 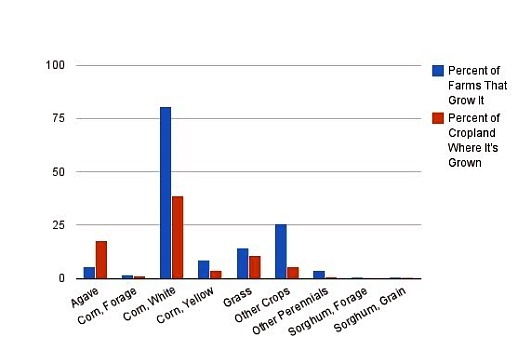 It halted the application of agrochemicals, and studied methods of organic agriculture and land restoration. Its coffee, adroitly marketed, commands premium prices, double those of regular coffee sold on the New York market. The Mam have effectively taken advantage of modern technology, from phones to e-mail, to overcome their isolation, and compete on their own terms, developing export markets in many European nations, as well as the U.S. and Japan. At the same time, the Mam have re-invented their cultural identity and helped revive the language and traditional forms of dance. They have also rewritten their past. The revisionist version is that they always had the utmost respect for nature and had always lived in harmony with the environment. In reality, as historical geographers have demonstrated, this was not always the case. Whatever the historical reality, the defense of the earth, nature and their culture is now central to the Mam. The main source for this post is R. Aída Hernández Castillo’s Histories and Stories from Chiapas. Border Identities in Southern Mexico (University of Texas Press, 2001).